Wink Slots is your one stop shop for all things slots related. There you will find a huge collection of the very best and latest slots games along with incredible bonus offers and exclusive promotions. There will be something to suit every level and style of play. Wink Slots will also be an authority on the topic of slots, providing quality articles, information and tons of educational material. At Wink Slots, fun and convenience top the agenda as all the games can also be played whilst you are on the go, as well as on your desktop. Mobile slots can be played on any Android or Apple mobile device, providing you with a great time filler when you are stuck in a queue or waiting for the bus! As well as having a great time, you will also be in with a chance of winning some great cash prizes or maybe even hitting one of the incredible progressive jackpots! Wink Slots has all the best and latest slots games. Wink Slots also features articles & slots education. Wink Slots games are available on mobile as well as desktop. Wink Slots games are lots of fun. At Wink Slots you may even win some great cash prizes. We could all use a genie in our lives, which is why Wink Slots chose to feature this great game… And it’s not called Millionaire Genie for nothing. The game’s progressive jackpot is linked across many platforms and it sometimes reaches amounts as high as £1.5m! Even daily games can lead to massive cash prizes of up to £15,000, proving that wishes do come true. But Millionaire Genie isn’t just about the money. The game enthralls and entertains you with its beautiful 3D animations and enhanced graphics. The stunning genie hovers over your screen, guiding you along and granting your requests. Even the Arabian nights style of music is enchanting. The game itself is a classic slot, with 5 reels and 15 pay lines. There is no shortage of bonus games or free spins, plus the sticky wild symbols at to the excitement whilst increasing your winning odds. There is no doubt that Millionaire Genie will take your breath away! Huge progressive jackpot could make your wishes come true. 5 reels, 15 pay lines. No shortage of bonus games, free spins and sticky wilds. 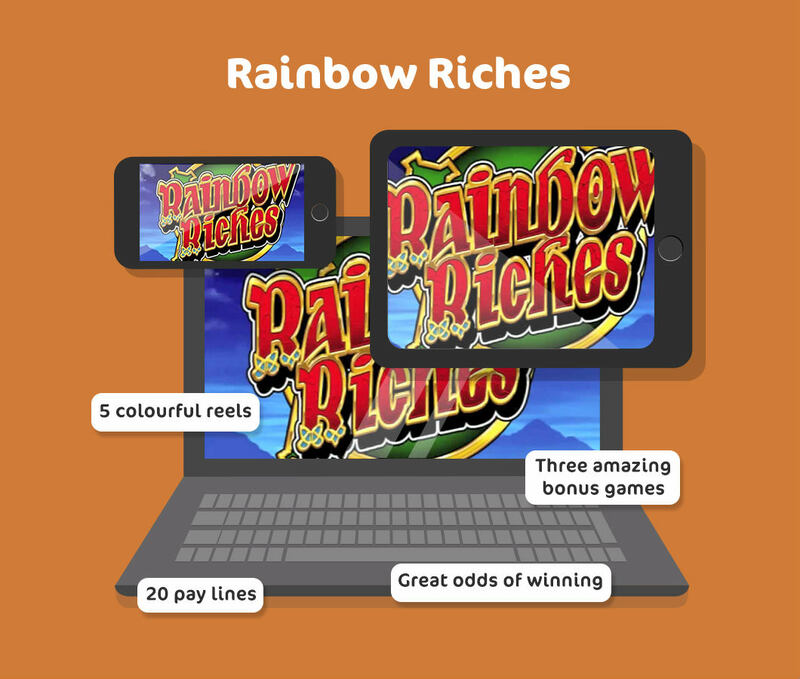 Rainbow Riches is one of the more iconic slots games out there. It is a classic game that has stood the test of time with its colourful 5 reels and 20 pay lines. There’s a 20,000 coin jackpot and three exciting bonus games; In Road to Riches you can win up to five times your original stake, all you have to do is spin your way along the road. The Pots of Gold bonus game confirms that there really is a pot of gold at the end of the rainbow… Or you can toss a coin into the Wishing Well, who knows what this bonus game might throw back! 5 colourful reels and 20 pay lines. 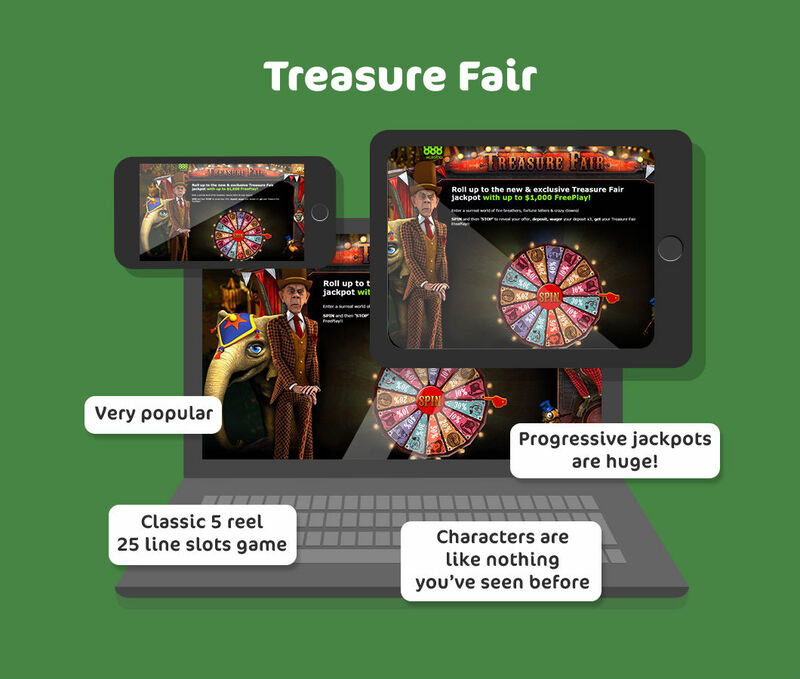 Treasure Fair is one of the finest online slots productions currently available. Months of skill and effort went into the making of this hauntingly beautiful game. An eerie old fashioned fairground provides the perfect backdrop for this classic slots game, which contains 5 reels and 25 lines. Plus the characters take on a life of their own, luring you in to their spooky world. No expense was spared on the 3D graphics and animation or the spine chilling music. Within just 6 months of its release, Treasure Fair became one of the top five casino games. Its huge popularity ensure that the progressive jackpots are equally massive. To top it all up, you can unlock a plethora of exciting bonus games. Treasure Fair is definitely a game not to be missed! Treasure Fair is one of the finest online slots productions. It’s a classic 5 reel 25 line slots game. The characters in Treasure Fair are like nothing you’ve seen before. Due to its popularity, progressive jackpots are huge. Sometimes the simple things in life have the most impact. Starburst is a perfect example! It’s a classic slots game that is about as simple as they come, with 5 reels and just 10 pay lines which provide 10 winning patterns, perfect for newbies as well as experts. Yet with all its simplicity, the big sparkly rocks and stars always have you coming back for more, not unlike those traditional slot machines found in Las Vegas casinos. The cosmic theme contains colorful and sparkly graphics which really come to life in the unique Starburst wilds. These innovative wilds expand over the whole reel and stay put for up to 3 additional spins, at no extra cost. If you play Starburst slots you’ll have a truly cosmic experience! 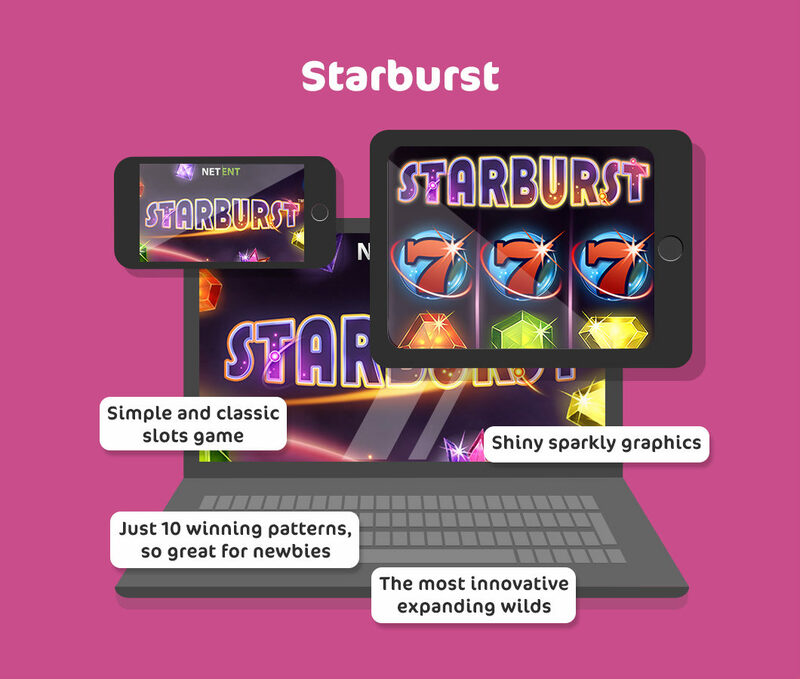 Starburst is a simple and classic slots game. There are just 10 winning patterns, making it great for newbies. Starburst has the most innovative expanding wilds. Shiny sparkly graphics will have you wanting more. 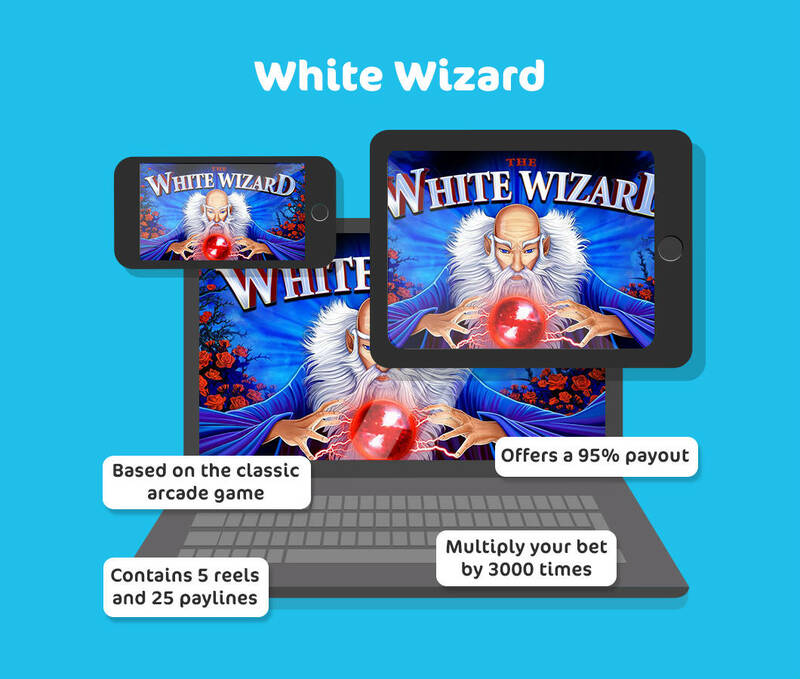 Die hard slots fans will love White Wizard which is based on the classic arcade game of the same name. This enchanting version will take you on a supernatural adventure where you will encounter the old White Wizard along with his magic cauldrons, magic wands and books of spells. The game contains 5 reels and 25 pay lines, and if you line up five of the cauldrons and you will be able to multiply your bet by a whopping 3000 times. The Wizard plays the role of the wild symbol and he helps you along by tripling your payouts. However, the Wizard is not the only generous one, the game providers also made sure that you receive a 95% payout of your winnings, so what are you waiting for?! White Wizard is based on the classic arcade game. The game contains 5 reels and 25 paylines. You can multiply your bet by 3000 times. White Wizard offers a 95% payout. These 5 hot picks are just a sizzling taste of the many exciting games to be found on Wink Slots. Hopefully this has wet your appetite and you’ll pay Wink Slots a visit to find out more!